Photo by Sam Thiel SMSU’s Megan Cull fires a pitch during game one of their doubleheader against Minnesota State University, Mankato on Tuesday. The Mustangs fell to the Mavericks 5-2 in game one and 1-0 in game two. 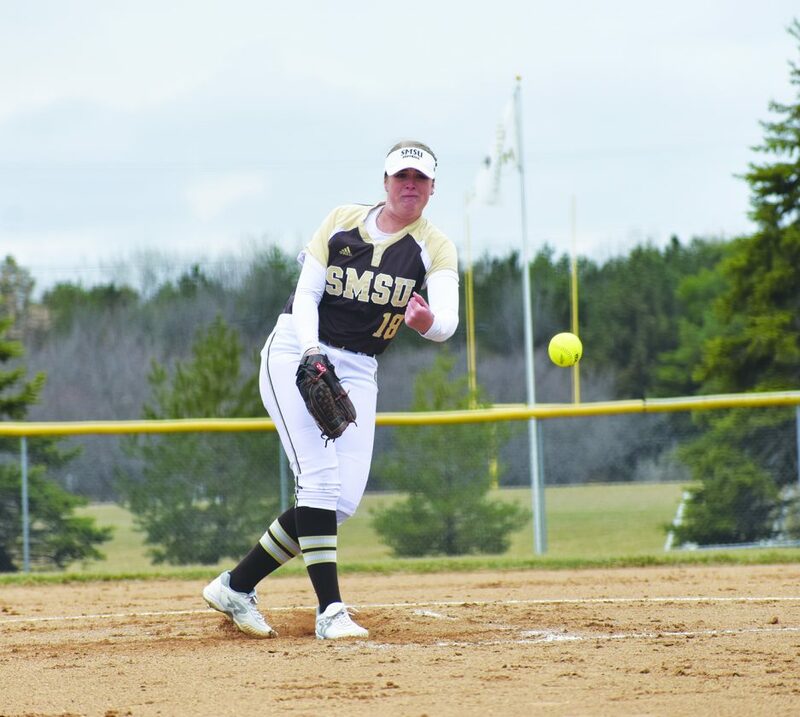 MARSHALL — The Southwest Minnesota State University softball team (11-15, 6-8 NSIC) dropped a doubleheader versus Minnesota State University, Mankato (22-14, 7-7 NSIC) with a 5-2 final in Game 1 after gaining an early lead and a 1-0 shutout in Game 2 at Mustang Field on Tuesday afternoon in Marshall. SMSU was the first to put runs on the board in the first game scoring two runners in the bottom of the inning. Bailey Johnson kicked off the inning with a single to left center and was advanced to third as Abbie Decker reached base on a fielding error by the Maverick in left field. Kali Tomlinson grounded out scoring Johnson to put up the first run before Lileya Kebos singled up the middle to score Decker. The Mustangs would hold their early 2-0 start until the third when the Mavericks strung together three hits to go on the board with one run. Back-to-back singles to left and right field put two runners on base before getting bought in on an infield single would bring the runner in. In the top of the sixth, the Mavericks took advantage of a six-hit inning to gain the lead and secure the victory scoring four runs. The Mavericks out-hit the Mustangs 13 to 4 in the 5-2 victory. Four Mustangs each recorded a hit a piece while MSU was led by Amber Kral who went 3-of-4 at the plate. Megan Cull (4-6) through seven innings with two strikeouts. The second game was a battle of the pitchers as Athena Golling (7-7) went to the circle to toss seven innings with six strikeouts. After the Mavericks the first batter of the game on base, Golling and SMSU’s defense retired the next 12 batters. The game was scoreless until the top of seven when MSU’s Cori Kennedy hit a solo home run over the left field fence to take go on the board and finish with a 1-0 victory. SMSU was led in batting by Johnson who went 2-of-3. Southwest Minnesota State (11-15, 6-8 NSIC) is scheduled to face Northern State on Saturday at 1 and 3 p.m. and MSU Moorhead on Sunday at 12 and 2 p.m. for senior weekend at Mustang Field in Marshall.